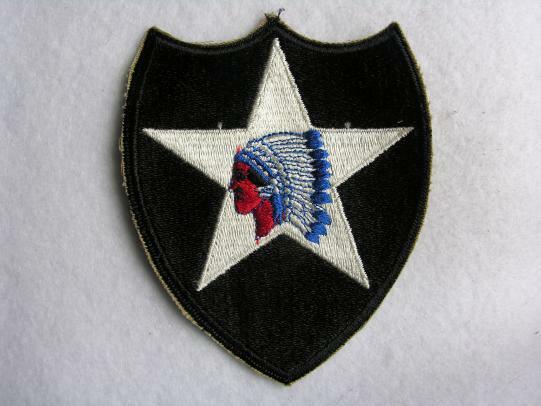 A 2nd Infantry Division original patch with O.D. border. 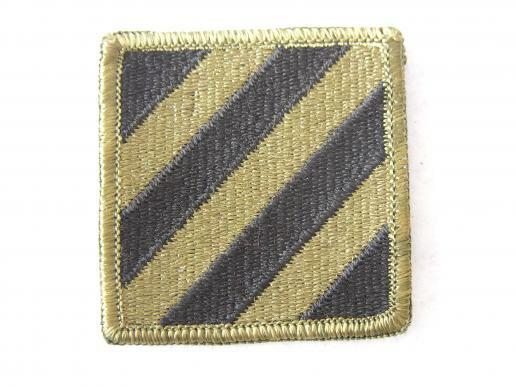 Used and removed from uniform. 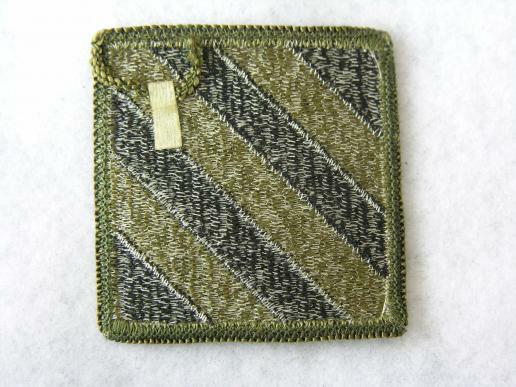 An original 29th patch removed from uniform and in good condition. 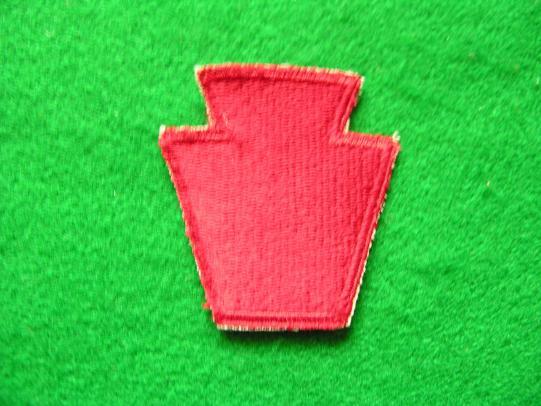 Green back original, good period example, used and removed from uniform 3rd Division patch. Some light service wear. The 3rd landed at Fedala in North Africa in 1942, captured French Morocco. Later in 1943 the division landed in Sicily, Salerno, Cassino, Anzio, Rome, St Tropez France, Ardennes, Munich and Salzburg. Seven campaigns, 531 days of combat, 26,000 KIA or wounded in WWII, lt Audie Murphy was in the third and America's most decorated person in WWII. 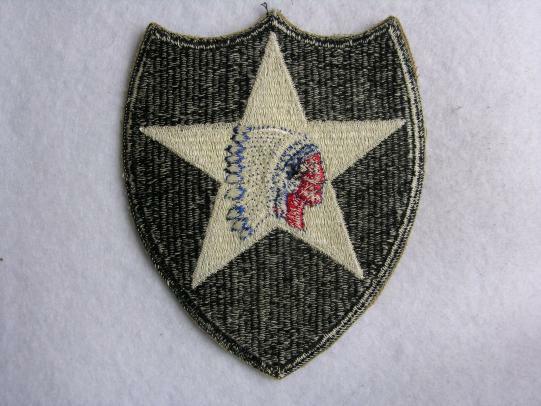 An period 2nd Infantry Division Patch some service wear and in good condition. 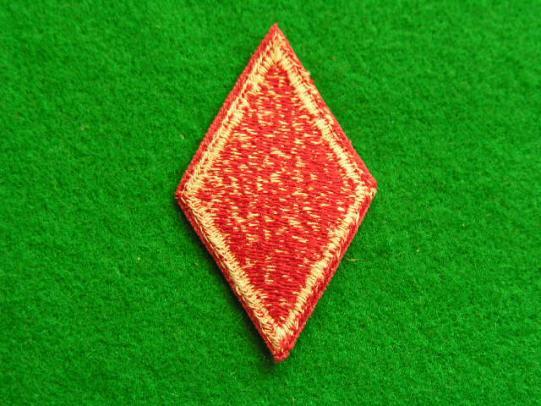 .After training in Northern Ireland and Wales from October 1943 to June 1944, the 2nd Infantry Division crossed the channel to land on Omaha Beach on D plus 1 (7 June 1944) near Saint-Laurent-sur-Mer. The division took a brief rest 19–26 September before moving to defensive positions at St. Vith, Belgium on 29 September 1944. The division entered Germany on 3 October 1944, and was ordered, on 11 December 1944, to attack and seize the Roer River dams. The German Ardennes offensive in mid-December forced the division to withdraw to defensive positions near Elsenborn Ridge, where the German drive was halted. In February 1945 the division attacked, recapturing lost ground, and seized Gemund, 4 March. Reaching the Rhine on 9 March, the division advanced south to take Breisig, through Germany and division crossed over to Czechoslovakia on 4 May 1945, . The division lost 3,031 killed in action, 12,785 wounded in action, and 457 died of wounds. 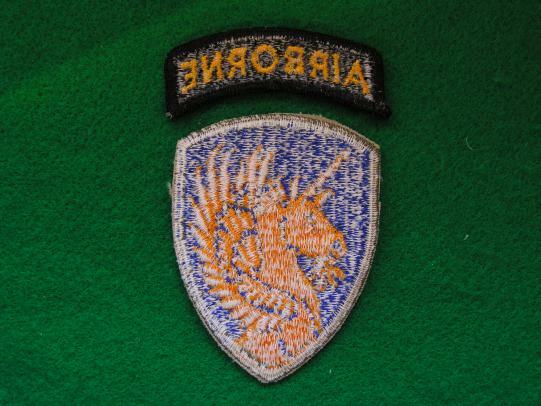 A 13th Airborne Division Patch with separate Tab. 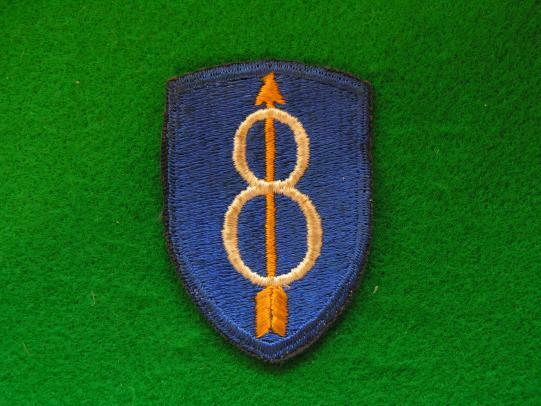 An 8th Division patch, used and removed from uniform. Landed Utah beach July 4th on to Brest, Ardennes and Germany. 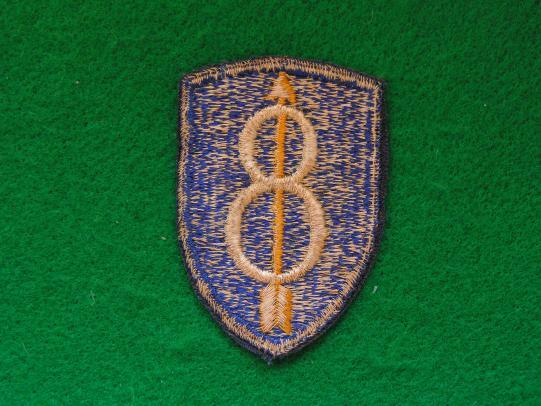 6th Fought in the Pacific Theatre New Guinea, Philippines. 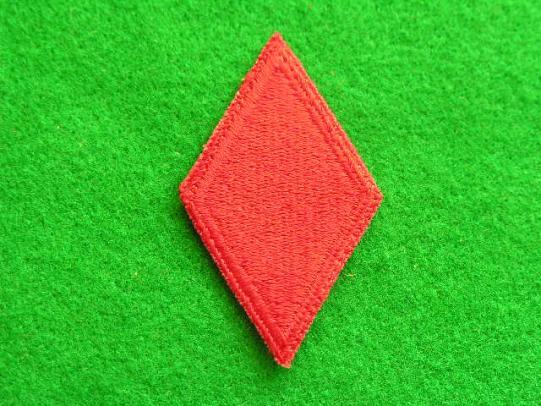 A good un-issued 28th patches, several in stock some un-issued also used and removed from uniform. The 28th Infantry Division after training in England, landed in Normandy, France, 22 July 1944, the men of the 28th took Percy, 1 August, and Gathemo, 10 August. On the 12th, Brigadier General Wharton was killed a few hours after assuming command. The Division began to roll north and east. Neubourg, 24 August, and Elbeuf on the 25th. After parading through Paris, 29 August, it continued its sustained drive through France and Luxembourg to the German border, assembling near Binsfeld, 11 September: It began hammering at the Siegfried Line, 12 September, destroying pillboxes and other fortifications, moved north to Elsenborn, 1 October, then returned on the 6th for patrols and rotation of troops. The 28th smashed into the Hurtgen Forest, 2 November 1944. 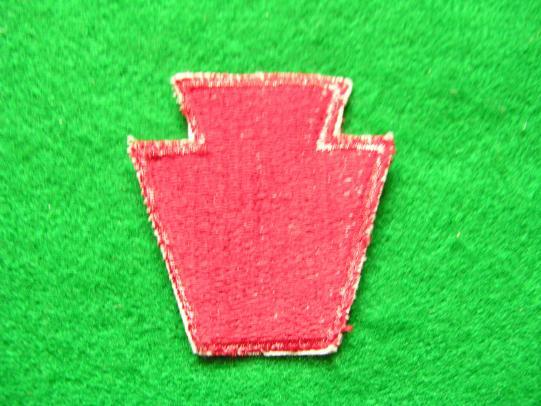 On 19 November, the Division moved south to hold a 25-mile sector along the Our River in Luxembourg. The Von Rundstedt offensive broke loose, 16 December, along the entire Division front. The 28th fought in place using all available personnel and threw off the enemy timetable before withdrawing to Neufchateau, 22 December, for reorganization. The Division moved to a defensive position along the Meuse River from Givet to Verdun, 2 January 1945, then to a patrol of the Vosges Mountains, 17 February. From 1 to 5 February, it participated in the reduction of the Colmar Pocket, headed for the Rhine and crossed the Rhine-Rhone Canal, 6 February. After an attack toward the Ahr River, 6 March, the 28th engaged in training, rehabilitation, and holding defensive positions. Beginning 7 April it performed occupation duties at Julich and Kaiserlautern until it left France. 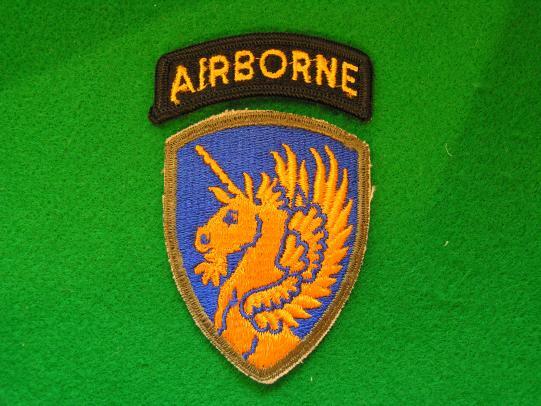 A good original 5th Infantry Division patch in mint condition.